Being comfortable I always say is one of my most important things when looking for fashions. Now that it’s getting chilly out, comfy and cozy go hand in hand. 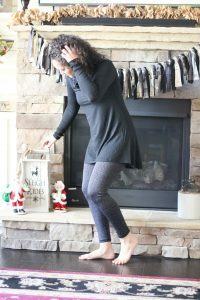 Cuddl Duds has all you need for comfort and cozy fashions. They have tanks, leggings, long sleeve tops, slippers and more. Oh an the leggings and tops come in various styles and designs. You are bound to find something that’s a perfect fit for you. So over the past couple days I decorated for Christmas and all I have left if to get the tree together! Yippie! Of course I had on my Cuddl Duds while getting all of my festive decor in place. Naturally Izzy wanted my attention so I had to stop and give her a little love in-between putting up the decor. Cuddl Duds makes the most comfortable clothes for hiking, home or running errands. Can I have all of their clothes? Like no joke… these leggings are seriously amazing and not tight on my tummy. 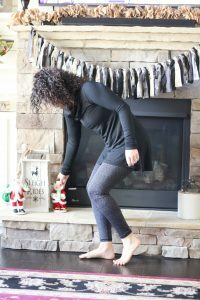 So if you are looking for easy, comfortable and cozy clothing for the rest of this fall and this winter I’m asking you to check out Cuddl Duds, because it’s amazing! Are you ready to go comfy with Cuddl Duds, you can find them at Macys? Dang girl, #ButtGoals! LOL Also, I love have a few pairs of Cuddl Duds clothing and I LOVE them! I really want to try these!! They look so comfy and you are so cute Eryka!! Get it mama! You look great! These pieces look comfy and cute! I love these picks! So so so cute and cozy and comfy!